Rotary tools, with their parts and accessories, are sometimes called a workshop in a box. Whether working with wood or some other medium, rotary tools are a useful and versatile addition to a workshop, and they make a variety of tooling tasks much easier. Rotary tools are handheld power tools with rotating bits. They are designed to operate as a motor with a flexible shaft or as a unit with the rotary bits attached directly to the tool. Both corded and cordless models are available. Those tools with flexible shafts generally hang via a handle, and the various bits are inserted into the end of the shaft. A foot pedal is used to control the fairly high speed of the flexible shaft-based tool. The smaller, handheld units — those with no flexible shaft — are heavier to hold, are not as powerful, and may not allow as much precise hand movement. But handheld rotary tools are generally more compact, less expensive, and easier to use. Hundreds of parts and accessories are available for rotary tools to provide a means for drilling, sanding, carving, cutting, grinding, or routing. These tools use small rasps, trimming tools, grinding wheels, and a huge variety of bits and burrs. Other accessories for handheld rotary tools, which help to make them more versatile, are router base attachments to hold the tool with its accompanying small router bits, conversion parts to make the tool into a miniature drill press, jigs to sharpen chainsaw teeth, and, of course, an auxiliary flexible shaft for finer work. Rotary tools are invaluable to wood-carvers, jewelers, hobbyists, and any craftsman who needs a small power tool that can be used to precisely work on a project. However, practice is especially necessary to operate a flexible shaft rotary tool. The high RPM values and low torque characteristics of these tools make them good for freehand use. Different materials and tasks require appropriate speeds and applied pressures to keep from marring the work. Motor speed is varied by the foot pedal, but maneuvering the shaft handpiece with the attached bit or wheel requires hand control, sometimes two-handed control. Wood carving and woodworking are two areas where these tools excel. They are a great help in carving intricate shapes for items such as birds and decoys. 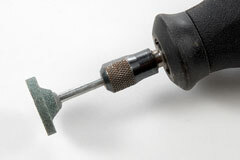 Rotary tool drills can produce very small holes, and cutting bits or rasps work to smooth or shape areas on hardwoods. Sanding drums of various sizes smooth minute, hard-to-reach edges. Jewelers also use these power tools to help create their designs. The flexible shaft machine is especially helpful not only for drilling, shaping, and sanding metal jewelry parts, but also for polishing the jewelry. 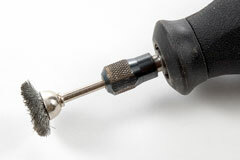 A variety of buffing wheels, emery disks, and drill bits help make the job easier. Other materials, such as plastics, metals, stone, ceramics, or glass, can be fabricated by hobbyists and homeowners with these rotary tools. With the diverse range of bits that are available, these high-speed tools cut or file without a lot of pressure. Always allow a rotary tool to reach its operating speed before applying it to a work piece, and be sure to wear safety glasses and a dust mask when operating these tools. Another type of rotary tool is a die grinder. Instead of small parts, these tools use large burrs and accessories; die grinders are frequently used by wood-carvers and metal workers for larger, rougher work. 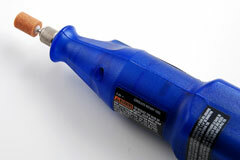 Dremel - handheld rotary tools for craftsmen and hobbyists. Foredom - flexible shaft rotary power tools. Metabo - high-speed die grinders. Pfingst - industrial rotary tools with flexible shafts. Rotary Tools Bit by Bit - evaluates four rotary tools. Wikipedia Die Grinder Description - discusses die grinders and rotary tools.